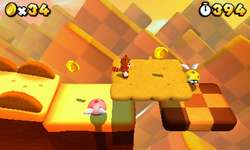 World 3-5 is the fifth course of World 3 in Super Mario 3D Land. This level can be accessed by collecting 15 Star Medals. The level is made almost completely of cookies, chocolate, cakes and takes place in the sky. The first area contains a cake bridge with cookie rails. Soon, Mario must step in some moving biscuits and stationary Yoshi Cookies with some Para-Biddybuds. Ahead, there are pink topping slices of cake, Donut Lifts and more Para-Biddybuds. A big checkered topping orange tart guards a Warp Box that teleports Mario to another tart platform, now with a slow auto-scrolling. In the next area, varied biscuits are used as platforms and near quick moving white chocolate platforms with many Para-Biddybuds must be crossed. Then, another Warp Box leads the plumber to an area with two moving biscuits and the level's Goal Pole. Star Medal 1: A little before the pink topping platforms appear, Mario can grab the medal by simply jumping off the moving biscuit. Star Medal 2: On the last Donut Lift of the level, Mario must wait for the platform to fall to be able to collect the second Star Medal. Star Medal 3: Above the chocolate platforms near the end of the level, there is a Star Medal that can easily be collected. The music played in this level is the Sweet Sweet Galaxy's music from Super Mario Galaxy, which in turn, is a remix of the athletic theme from Super Mario Bros. 3.